Troy Plunkett, SCI Active Network Founder, recently met with NorCal SCI's co-founder Nick Struthers to receive a chair donated by Kirk. 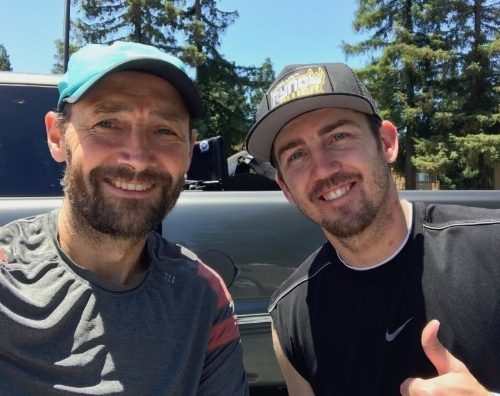 Kirk has kept in touch with Nick since his discharge from the Santa Clara Valley Medical Center Rehab more than a year ago. Since then, Kirk was fortunate enough to experience a lot of return since his SCI and while still working hard on his rehab, he now no longer needs his wheelchair. "The Share-A-Chair Program is designed to help newly injured SCI survivors with mobility, independence and a higher quality of life while waiting for fitting, insurance and the timely process receiving their custom wheelchair." says Troy Plunkett. "We now have 10 lightweight manual wheelchairs with 10 SCI survivors that have benefitted from our program over the past 18 months. Adding more wheelchairs with varying dimensions and components are important for us to grow our program in helping a larger capacity of SCI survivors." If you would like to donate a wheelchair or know someone who could benefit from the program, please contact Troy info@sciactivenetwork.org.